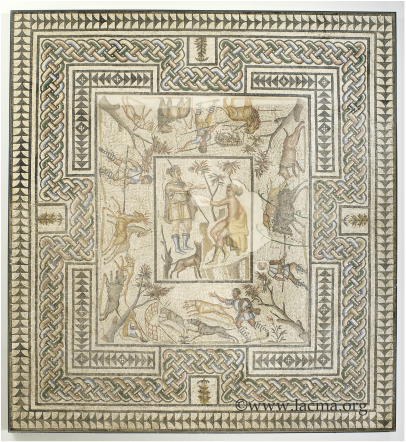 Mosaic on a floor : 9 ft x 8 ft, second century AC representing Diana and Callisto with hunting scenes. The theme is from Ovid’s Metamorphosis. The mosaic is preserved in a reserve of The Los Angeles County Museum of Art. The large mosaic explains in four panels the Greek and Roman mythology from the birth of the Earth untill Julius Caesar. The confrontations and adventures do not end in death but in metamorphosis. The passage comes from the second book ( about 401 AC). After a terrible fight and flooding devastated the earth, Zeus wanted to bring life again to the earth. He falls in love with a Virgin, favorite of Diana, the Goddess, called Callisto. Nine moon cycles later, Diana returns from hunting and wishes to refresh herself in a brook. Callisto refuses to get undressed : she is pregnant. Dians furious chases her away. When Arcas Callisto’s son was born, Juno who knows all about her husband’s ( Zeus) unfaithfulness takes revenge on the mother and turns her into a bear. Zeus, fifteen years later, sees Arcas about to kill a bear : it is his mother. So Zeus sends them both to heaven as stars. Thus we have the Great Bear and little Bear stars. The mosaic is composed of a central panel : Diana standing up, her haïr pulled up, dressed in a short tunic. Her arms and legs are bare. The Goddess wears high boots. On the right a second caracter, sitting on a rock in the shade of a tree. The woman wear shoes like Diana’s but is naked. They are Diana and Callisto. The exact moment of the scene is when Diana chases Callisto because it is obvious that she is pregnant. Four hunting scenes are around the central panel : above a barbarian fighter between a lion and a lioness that he has killed. In the background, a panther is dying, blood gushing from her belly and mouth. Next to the lion’s scene is a boar being hunted. The animal runs pursued by two dogs. The hunter is waiting for the kill. The third hunting scene shows a hare chased by two dogs. The animal runs into a cage where the hunter is waiting. The last hunting scene is a deer chased by two dogs and a hunter. The mosaic is bordered by branches, braids and triangles.